Munich - Despite the presence of a host of world-class players on the pitch, for Jens Lehmann one of the most intriguing battles in Der Klassiker between FC Bayern München and Borussia Dortmund took place on the sidelines. 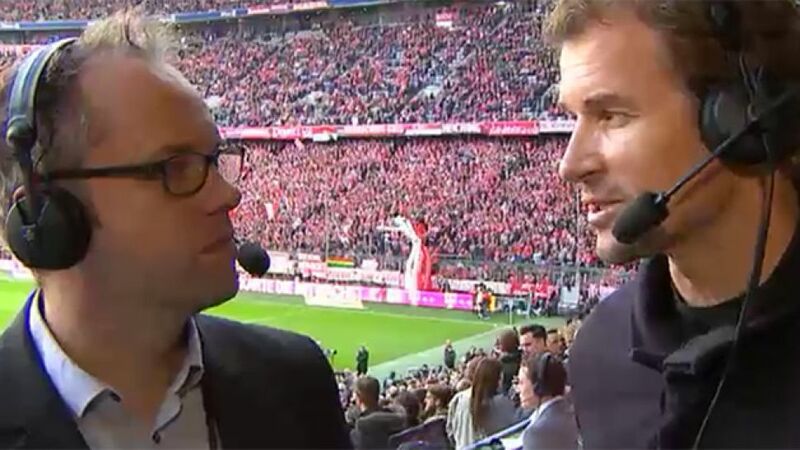 The former BVB and Germany goalkeeper took to the mic to co-commentate on the game in front of millions of viewers in 207 countries worldwide, keeping a keen eye on the clash between two of the most innovative coaches in football, Pep Guardiola and Thomas Tuchel, and their modus operandi. “The possession football Bayern play forces the opponents to drop deeper and deeper and deeper. The opponents tire out running after the ball all game and they make a positional error. And Bayern are so good at waiting for those chances to score," said the 45-year-old before kick-off. Click here for Der Klassiker highlights. "The way Dortmund started the game is very interesting to say the least. They only have four attacking players and moved have Lukasz Piszczek over to left-back. Tuchel had the idea of putting Sokratis Papastathopoulos up against Costa, as the Greek is a very tough opponent." Dortmund though started adventurously, forcing two early corners and a free-kick in a dangerous position. "It is clear that Bayern have a lot of respect for Dortmund in the opening stages as Julian Weigl is allowed time and space on the ball in the middle of the park as the Bayern defenders were dropping off. That’s something you don’t see too often, especially at home. And Guardiola is already intervening to try and push his players further up as he sniffed the threat." Even at this early stage, both coaches were on the edge of their coaching zones, directing play almost like a 12th man on the pitch. "Guardiola has changed his set up already and switched to three at the back. That’s why all of a sudden they have started to push further up and squeeze Borussia Dortmund high up the pitch." "Tuchel still hasn’t reacted to Guardiola’s change. Perhaps he hasn’t spotted it, however, as you can’t always spot it immediately when you are at pitch level. And you see the change has had an immediate effect, Borussia Dortmund can’t play the ball out of defence as easily." "As ever, Dortmund have a very compact formation making it difficult for Bayern to play through the lines. But I think we’ll now see a period of dominance from Bayern because Dortmund are playing with two central defenders against just one striker and that will give them a man extra everywhere else on the pitch." "You can see the big gap now between the three forward players and the rest of Dortmund’s midfield. This means they won’t be able to pressurise Bayern as they are afraid of over committing themselves." "The crucial pass came from Mats Hummels. The cutting diagonal ball to Henrikh Mkhitaryan. One-touch football. Dortmund now need to manage to get forward better than they have been doing." There was little opportunity to do so, however, as Bayern pressed hard and high. "Guardiola has changed the formation once again. They’re playing 4-4-1-1. He seems to be very wary as Dortmund are getting more of chance to control the midfield. Bayern will wait for the counter-attack now." "You see the benefit of Phillip Lahm’s ability on the ball. He doesn’t just clear it, he keeps possession, looks for a solution and that has now set up another Bayern attack." That counter may have proved futile, but right at the start of the second-half, Bayern delivered a killer blow with the third just 22 seconds after the restart with a carbon copy of the opener. "The Bayern goals came from a tactic that Borussia Dortmund should have been using. The long balls from the back for Aubameyang to use his pace and go and burst through. But his starting position has been too deep in the Bayern half and it’s Lewandowski and Müller who have used the tactic." Thomas Tuchel tried to shake things up with a double substitution. Marco Reus and Adnan Januzai entered the fray. "And Bayern have reverted once more to a back-four. And we can see once again their fantastic positional game. As long as the opponents don’t come out and play three at the back, they will always outnumber them in midfield. It’s hard for Dortmund to get the ball and Tuchel needs to be brave and change the shape if he wants to get something out of it. If not, they will concede more." "Gündogan has battled hard but you suspect that some of the Dortmund players are not yet ready for this big stage. They can gather good experience today, players like Bürki and Weigl. And Reus too needs a secure place in the team to perform at the highest level. That is the difference to Bayern. They have so much experience, their positional play is fantastic and they have the desire to dominate." "Jürgen Klopp always managed to get some great results at the Allianz Arena and now that is the job facing Thomas Tuchel. He has to find solutions to be competitive here. Unfortunately he has lost the battle of the tacticians by a mile today." Tuchel had taken a gamble by reshuffling his defence. Sven Bender started at centre-back for the first time in almost two years. Lukasz Piszczeck played at left-back for the first time in his Bundesliga career. In the end, there was no further action as Bayern switched to cruise control and sealed the 5-1 victory. "The killer for Borussia Dortmund was the early goal after half-time. They didn’t recover from that. They showed some good moves in the first half after going 2-0 down. They were a bit scared to open up their defensive line because you know when Bayern get their positional game going it is always a threat. It was a learning day for Dortmund. Their players will get another chance to play at such a high level." "Bayern dominated sometimes through the individual brilliance of their players but through their positional and tactical set-up."